SITVIT2, online consultation of the WorldWide database of M. tuberculosis. SITVIT2 is a genotyping molecular markers database focusing on Mycobacterium tuberculosis complex. It contains major types of molecular markers such as: Spoligotypes, 5ETRs, 12-loci MIRU-VNTR, 15-loci MIRU-VNTR, and 24-loci MIRU-VNTR markers. Spoligotypes are patterns formed by the presence or absence of 43 spacers in the DR locus of Mycobacterium tuberculosis. This pattern can be seen as a 43 digit pattern or under a reduced octal form of only 15 numbers. MIRU-VNTRs markers (Mycobacterial interspersed repetitive units-Variable Number Tandem Repeats) are variable number of tandem repeats (number of copies). 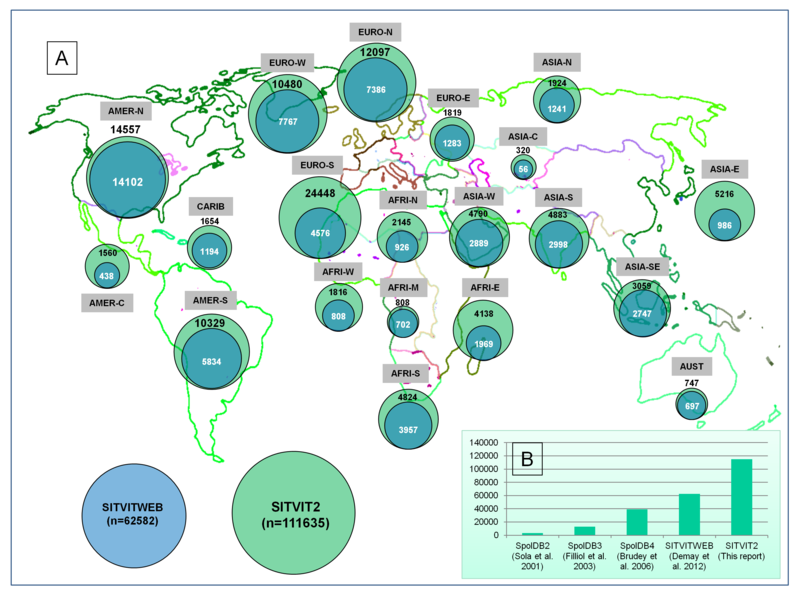 SITVIT2 database represents a huge collection of epidemiologic, demographic and genetic data which allows an exhaustive overview of worldwide distribution of Mycobacterium tuberculosis complex. When available, the genotyping data are also analyzed in function of bacterial drug resistance, demographic, clinical, and geographical characteristics. SITVIT2 database now contains information on 111, 635 entries. This table is a description of SITVIT2 database as consulted on March 2014. Full list of Contributors is available upon request. Data recorded in SITVIT2 as compared to SITVITWEB database: (A) Distribution by subregion; (B) Gradual evolution of databases. The figure can be zoomed and dowloaded as a PDF file. if the figure is not reachable, please download Adobe Reader or a similar application software. 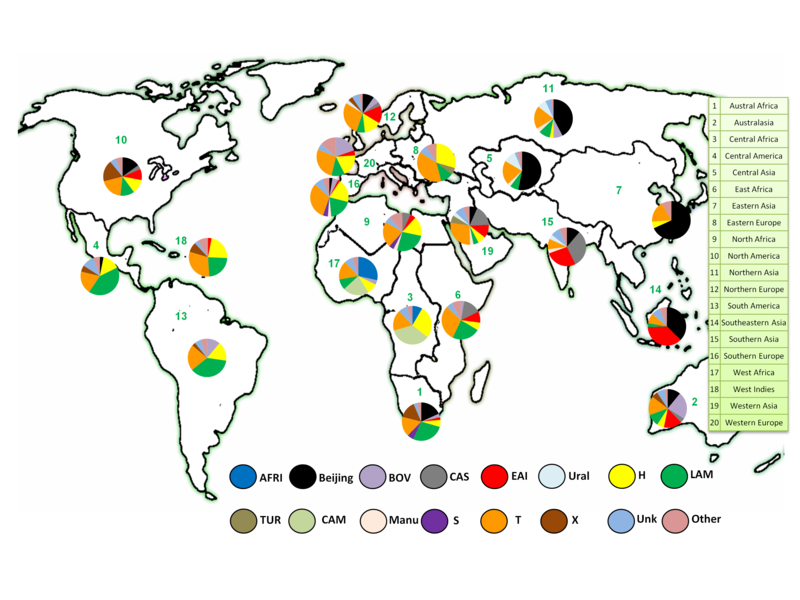 Geographical distribution of the major M. tuberculosis lineages according to spoligotyping data in SITVIT2.